Dubai-based property developer Invest Group Overseas (IGO) will invest Dh2 billion in new real estate projects over the next few years, its CEO said. “We handed over Polo Town Houses last year and now we are in the process of handing over last group of apartments from Polo Residences in Meydan. We have additional projects that will add Dh2 billion worth of our investments up to 2020. Two projects will be launched during the course of the years. They are more likely going to be residential towers,” he noted. 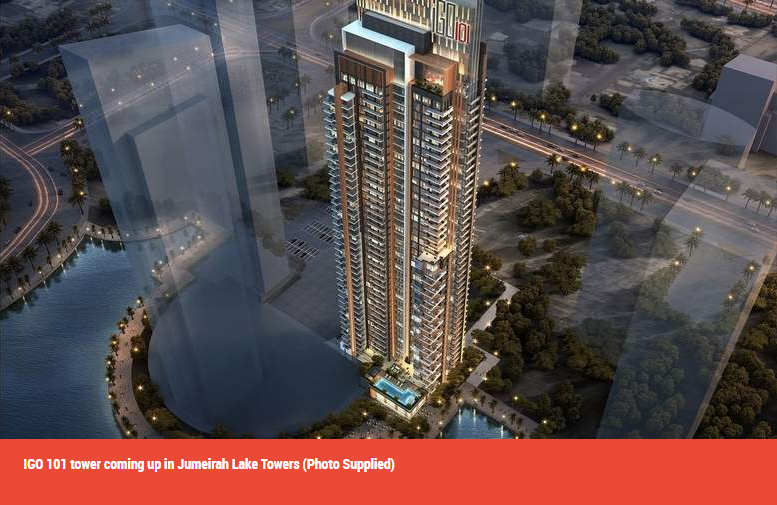 Scheduled to complete in Q4 2020, the IGO 101 tower in JLT houses gym with showers and saunas, a health club and squash court, outdoor swimming pools, jacuzzi and sundeck with loungers overlooking the lake below, a kid’s play area, as well as retail, food and beverage outlets. Kozbari ruled out that Dubai’s real estate market is saturated as there is still ample space for new projects and the emirate is growing strong on the back of state-of-the-art infrastructure. Starting prices for one-, two-, and three bed room apartments are Dh795,000, Dh1.69 million and Dh2.94 million, respectively. “We have projects in other parts of the world, but we are focused here. Dubai is another London, New York, Paris. Dubai is not a common city anymore. There is no city in the Middle East which has the same infrastructure that you have it here – including physical, economic or political infrastructure. Dubai is a safe haven for investments. I don’t believe the emirate’s property market is saturated. There is still ample space for new projects to come because the city has not stopped progressing and growing,” Kozbari added. Property consultants Cavendish Maxwell estimated that 30,402 homes to be completed in Dubai by the end of 2017. The break-up is 24,259 apartments, 3,778 villas and 2,365 townhouses, according to information obtained from developers, consultancies and sub-contractors. Invest Group Overseas is currently developing a big project in Dallas, Texas. With the projects in the pipeline, the company sees it portfolio exceeding $3 billion.